I wake up groggy eyed and disoriented from some strange dreams. I dreamt about how my vegetarian flat mate is back after a long holiday and she’s scrubbed the fridge clean of any traces of chicken and egg. I’m slightly guilty but annoyed that I didn’t take necessary precautions and hide / finish the stuff earlier. I get out of bed, and it’s too quiet, there are no bags in the hallway. So she isn’t really here. Go back to the drugged sleep. To wake up in another world where my cousin has an interview lined up and I have to report for my internship duties at a social media firm. It’s close to eleven and I’m so late. It’s around twelve when I’m ready and I’m thinking of excuses to convince the boss I wasn’t coming late for fun. The reason for this drugged, still sleepy feeling is probably the oil on my mane. It’s raining like crazy outside and I have no intention of moving from the balcony into the shower. I guess we’ll let nature take its time with the downpour and watch and listen to the sounds. That’s my view. 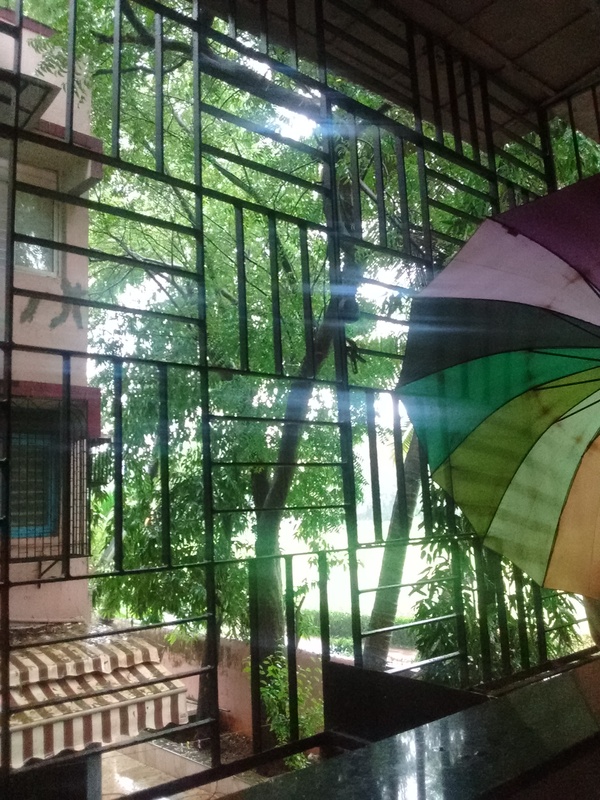 Our maid has kept the spare umbrella in the balcony and that’s sort of blocking my view. We don’t have any onion or tomatoes. I am not sure what I’ll do for lunch. Or breakfast. But I do not have the mental capacity to think so far ahead. Its a four day work week and that makes me happy. So yaaay. That’s all, folks, from this sleepy, 25-year old. I’m busy taking baby steps to know or tell you any more. Adios.